This gorgeous pink bunting is 1.8 m long. It comes fully assembled and ready to hang for simple and stylish decorating. SKU: CE293313 Categories: Valentines Day, Easter, Mothers Day, Pink Ribbon Day, Pink, Hot Pink, Bunting Flags, Ballerina, Bunny, Cupcakes, Fairy, Flamingo, Glamour, Owl / Bird, Parisienne, Pink & Gold, Princess, Mexican Fiesta, Parisienne, Pink, Pink Zebra, Baby Pink, ON SALE! 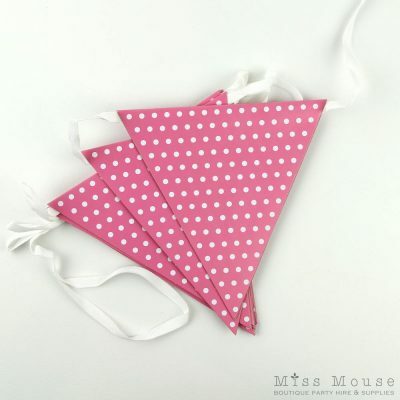 Our Polkadot Bunting Flags ~ Pink are a great decorating option! This stylish bunting comes fully assembled and ready to hang making for very easy party decorating. It is made from thick card and decorated in pink with small white spots on both sides. You can use these bunting flags for multiple occasions and it will still look great; or you could use it to decorate a nursery or play space after the party. Each flag is 11 cm wide and 15 cm long. There are 9 flags per bunting which are strung on 1.8 m of white ribbon. Pack size: 1 bunting, 1.8 m long. These are beautiful pink bunting flags which are perfect for a Pink Ribbon Breakfast, princess party, ice-cream parlour party, Valentine’s Day and more! They are a great length for hanging behind a party table or above a buffet. They also look lovely strung across a window. This style of bunting looks neat teamed up with an assortment of pink and white balloons or fluffy tissue paper pom poms.